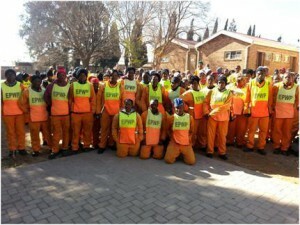 The City of Johannesburg has created 193 000 work opportunities through the Expanded Public Works Programme (EPWP). Now in its second phase of implementation, the EPWP seeks to create jobs for unemployed and unskilled people through programmes and projects rolled out by the City’s departments and entities. As the City of Joburg prepares to celebrate 20 years of democracy and freedom for its people, and of considerable progress with delivery of essential services such as housing, clean water, reliable power, and quality sanitation, it recognizes that infrastructure development is at the heart of these achievements. Today, as a result of major infrastructure projects being undertaken, Joburg is a much better place to live in for the majority of its residents than it was two decades ago, and shares a tangible sense of pride in its achievements. As a result, the City of Joburg has recently been publicly recognized as the best-performing metropolitan municipality for the vision and achievements of its Expanded Public Works Programme (EPWP). The City was awarded with the prestigious Kamoso Award for Excellence in 2013 as the country’s Best Metropolitan Municipality in the prestigious Infrastructure Award Category, for its successful implementation of EPWP and resulting in socio-economic impact amongst communities and individual beneficiaries in the City. In 2011/12, the City has scooped four Kamoso Awards. The City of Joburg provides its residents with a high quality of life and endless economic opportunities by providing excellent transport and telecommunications infrastructure services. In the last financial year alone, the City’s infrastructure investment stood at R4.3 billion, with a focus on improving water, electricity, roads, and transportation infrastructure services. Highlights included the investment of R1. 2 billion on maintenance, upgrades and new infrastructure to enhance service delivery: e.g. replacement of near redundant pipelines, street lighting, and upgrading the electrical network. Gravel roads were upgraded to surfaced standards in Diepsloot, Ivory Park, Braamfischerville and Orange Farm. Open storm-water drains were converted to underground systems in Diepsloot, Ivory Park, Alexandra and Orange Farm. Considerable work was also undertaken to resurface, rehabilitate and reconstruct roads. The City of Joburg’s EPWP has created 36,588 work opportunities in 2012/13 financial year, as a result of its innovative approach and successful implementation of the programme. The Kamoso Awards were instituted in 2007 as an annual ministerial event aimed at rewarding those who have excelled in the implementation of the EPWP. Through these awards, the National Department of Public Works (NDPW), in its role as the leader and coordinator of the Programme, encourages, motivates, recognises and rewards the best-performing Government departments, municipalities, provinces and public bodies for their significant contribution to alleviating poverty and unemployment through the creation of work opportunities. The Kamoso Awards in 2012/13 were of a particular significance, as they aimed to mobilise implementers of the Programme to increase their efforts in making a socio-economic impact among communities and individual EPWP beneficiaries. The City of Joburg has also been recognized by the recent UNEP Liveable Communities Awards 2013, where it received the 1st Place Gold Award in the Socio-Economic Category, plus two additional gold awards for its efforts and programmes. The City was also the recipient of the recent 2013 National Arbor City Award, Urban Category, for its innovative greening programmes for a sustainable city.